In my opinion, weather apps should be as simple and straightforward as possible. Sure, animations and transitions are nice, but a glanceable, no-frills experience – interfaces uncluttered by auxiliary information – is even better. 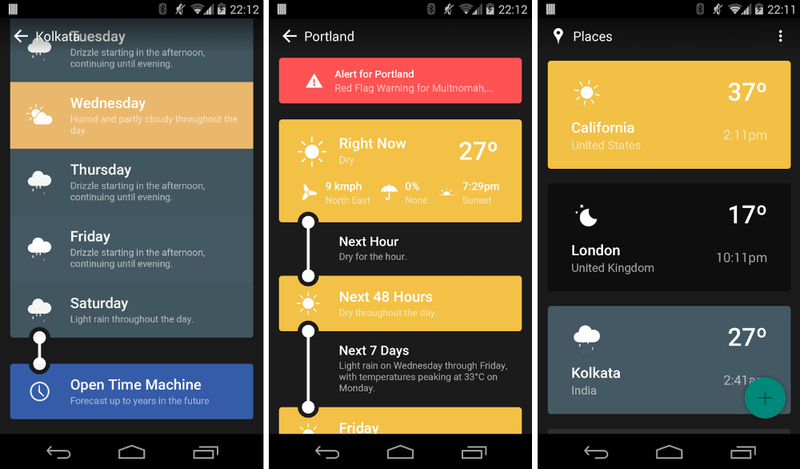 Weather Timeline, a new forecast app inspired by Material Design, nails the paradigm of which I speak. A weather app should, first and foremost, provide immediate access to the data you most commonly seek – temperature and conditions. Weather Timeline checks that box, listing locations you save in block elements which change color depending on precipitation. Tapping on an element pulls up the extended forecast, which, true to the app’s name, is arranged like a timeline. Each component, such as hourly, daily, and weekly weather, is connected by lines or arranged adjacently, which look quite slick. Weather alerts are embedded inline. The app is tactfully embellished with Material Design touches, like the “add locations” button and the search bar transition. But design is not the only headlining feature. Weather Timeline’s “time machine” forecast is an almanac of sorts, allowing you to search historical weather records or glance at forecasts projected years in advance. A DeLorean appropriately animates as you search. Weather timeline is not free, but I think developers that give aesthetics the attention they deserve should be supported. It’s $1 in Google Play.